HPR Song - Didn't sing it! He told the story of his recent Tactical Training. His goal was to finish the four day training and not to finish last. He was the oldest one there and finished in the top 1/2 of the class. His message: "You're never to old to participate!" Kelimaria showed us pictures of her family. Started with Mother and Father, her first husband and their 2 children Jennifer & Christopher. They owned 2 auto part stores including Yelm. Their marriage was dissolved. Kelimaria started dating. She didn't call her suitors by name but by numbers. Bachelor #1, Bachelor # 2 & Bachelor #3. Bachelor #3 engaged Disney's Mater Tow Truck help to ask Kelimaria to marry him. Bachelor #3 won the hand of Kelimaria and they have been married for 8 years. They spent one week at Disneyland & one week on a Disney Cruise for their honeymoon. Together Steve and Kelimaria reorganized his company from Tumble bus to Kidz n Motion. They also started Moose Head Transport. They sold Kidz in 2014. They have a blended family of 5 children. They entertain kids for the holidays if those kids don't have anywhere to go. They never know how many people will show up for their holidays and they like that just fine. They spend a couple of weeks in December at a cabin at White Pass, where they snowmobile She loves baseball. Kelimaria has a 12' long arm sewing machine and she does stitching for people that do quilts. She gets $100 per quilt and it takes her 3 hours to do stitching per quilt. In her spare time from babysitting her two Grandchildren, she volunteers for the auxiliary at the local VFW & works with City Gate Ministries. Kelimaria is also Secretary of our Rotary Club. Started as a Loan Officer and Olympia Branch Manager of First University Mortgage in 1991 after 20 years in auto industry. Managed Olympia Branch Offices for three regional mortgage brokers. In 1998-2000 had two branches, 16 Loan Originators and 8 staff personnel. In 2016 after over 25 years managing for others, finally opened my own Mortgage Company and work out of my home in Lacey. Blake Knoblauch says his ancestors moved from Germany and founded Sumner, WA. They were farmers and grew rhubarb. They were the first to use the Hot House concept to grow rhubarb year around. They were one of the families that founded the Puyallup Fair. He gets 44 free tickets per year to the Puyallup Fair. One of the perks that he gets because he is an ancestor of one of the founding family. His father moved his family to Olympia in 1975 to take a job at Columbia Beverage Company now PepsiCo Northwest Beverages. His dad retired as the General Manager of the operation. He graduated from Timberline High School - Go Blazers! He went to UW. Then he got into Real Estate. He was a Real Estate Broker for almost 10 years and worked at Greene Realty Group. Then he became a partner in Cigar Daddies and worked there for four years. David Schaffert, President & CEO of the Thurston County Chamber of Commerce called and asked him if he wanted to become a part of the Member Services Team because of his knowledge of the RETRO Program. He has been there for 2 years! He has volunteered for the Olympia Master Builders and took Bob Kagy's place as the Treasure of that organization. He served in that position for several years and eventually went on to serve as Associate Vice President, he was on the Executive Committee for a total of 5 years. Blake also served on the Board of the Big Brothers Big Sisters of Southwest Washington for a number of years. He is currently serving as the President of the North Thurston Public Schools Education Foundation. 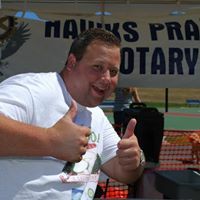 Blake is the Vocational Services Director for our Rotary Club. Everyone interested in serving on the new Ways and Means Committee, (Fund Raising Committee) chaired by Buddy Stevens, please RSVP to Vice President, Terry Taylor (terry.versoriaonline.com) and show up at the Emperor's Palace on Martin Way at 11:30 am on September 24. We're not meeting next Fridaythe 28th of September because we're meeting Wednesday the 26th of September from 6:30 - 8:00 at Forza's for Trivia. Trivia starts at 7:00. Bring your guests, we're looking to grow our club! PP Dave Newkirk wife is expecting another baby. Congratulations. PE Buddy Stevens lamented the medical system. He will get another stent put in. Hang in there Buddy and get well soon. PP Bob Kagy thanked all the speakers. He said he was glad that we were doing this. He has enjoyed getting to know our members better. PP Noel Ostrander said he was pround of his daughter. She is first chair for Violin playing! Congratulations. Richard Bokofsky berated the University of Washington Huskies for playing a powder puff. Raffle Drawing - PP Dave Newkirk won the raffle and will get a free lunch. We will start with $211 this Friday the 21st with only 7 marbles left.